Essential health tips for your clients of senior care services. Quit smoking: Aside from cancer, smoking causes a plethora of other health issues such as heart disease, excessive wrinkling and hardening of the arteries. If your clients want to stay healthy, they should quit smoking immediately. Eat well: Remind your clients how important it is that they eat a healthy diet. Heart disease, diabetes and high blood pressure often result from eating poorly. Your clients should be consuming plenty of fresh fruits and vegetables as well as chicken and fish. Since women are much more likely to develop osteoporosis, encourage calcium and vitamin D supplements for them. Prevent falls: One of the biggest reasons that seniors get injured is because of falls, which older adults are more vulnerable to. Talk with your clients about fall prevention and how they can stay safe by removing carpet or throw rugs and making sure that electrical cords are out of their walking path. Stay up-to-date on health screenings: When your clients reach age 50, they'll either need to start getting annual mammograms or prostate screenings done. You should encourage them to undergo these yearly exams so doctors can make sure they have no signs of cancer or other illnesses. 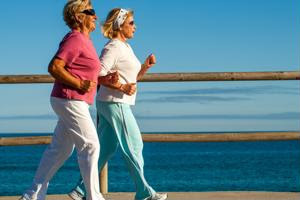 Exercise often: The U.S. Centers for Disease Control and Prevention recommends that older adults age 65 and older get at least 2 hours and 30 minutes of moderate-intensity aerobic activity every week and participate in muscle-strengthening activities at least two days per week.